There’s no doubt Android Market will at some point offer more applications for download and/or purchase than Apple’s App Store, as the latter’s growth has been slowing down of late, while the Android application store’s growth rate has been accelerating. In a recent report, app store analytics company Distimo forecasted that Android would surpass the App Store in size before the end of July 2011. 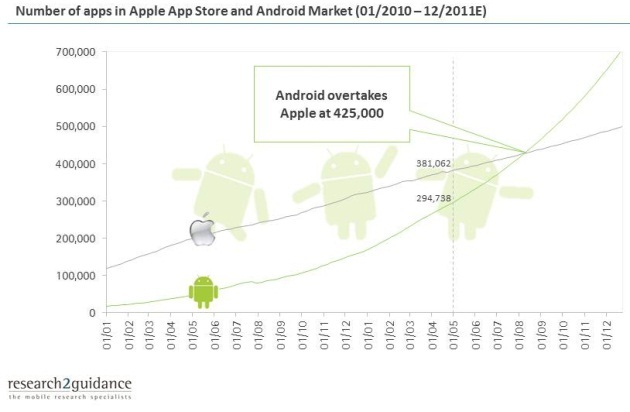 Another research firm, Germany-based research2guidance, corroborates Distimo’s findings; the firm forecasts Android to blow past Apple’s App Store by August 2011. Provided current growth rates for new app uploads are maintained, research2guidance expects Android Market to reach 425,000 apps next August, effectively overtaking App Store in size. According to the firm, Android Market added 28,000 new apps in April 2011, whereas Apple lagged behind with only 11,000 new apps. On the contrary, the success of an app store is negatively correlated to the success of an average developer. All analysis on the early months of an app store including the Android Market shows that average download numbers decrease dramatically after the first months or even weeks after the launch of the store. The long tail gets longer and longer while the top 5% gets richer and richer. Be that as it may, Android Market’s stunning growth is worth noting, especially because it came out the gates fairly slowly.